Home » Blog » Updates » Welcome to the new B&T website! Welcome to the new B&T website! We at B&T are proud to present the new website of B&T Computers and Trading. If you’re new here, then everything is, well, new. However, if you’ve been here before, you may notice that much has changed. The new site allows us a much better way of presenting the full scope of what we do here, including listing more of our merchandise for sale, and allows us more room for future online expansion. Why make a new website? The new website is the product of more than two and a half years of work. 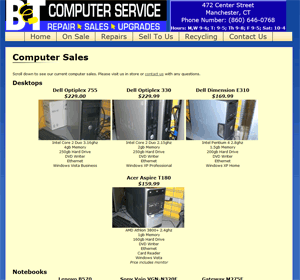 When btcomputers.net launched in September 2009, the goal was to get us online, because we didn’t even have a website! Imagine that–a business all about computers that didn’t have a website! Well, that was quickly remedied, but there were problems. First, we had to edit it by hand. That meant going into a text editor and adding all the code in. It was a drag to do. Even worse, the website wasn’t suitable for much more than information about our computer merchandise and services. Though we had some information regarding the trading side of the business, the lack of categorization made it difficult to separate different type of merchandise. That, and the fact that everything about the site was so geared toward computers meant that visitors looking for us in the search engines could easily bypass us if they were interested in instruments or TVs. With the new website, we aim to fix all that. Now merchandise is categorized; just hover over the “Merchandise” button in the menu above. Our products for sale are separated into four different main categories: Computers, Video Games, Electronics and TVs, and Instruments and Amps. Others will be added over time as necessary, but that’s what we’re starting out with. We do have other types of merchandise, such as glassware, so be sure to visit us in store to see everything. Wait…you guys sell more than computers? Yep! We’ve actually been selling on eBay since 2000 (see our eBay listings), and more or less full time since 2002. When we moved from 145 Main Street to 472 Center Street in 2008, we began to sell more in store merchandise, expanding into TVs, electronics, video games and consoles, instruments, and much more. We have also been buying and trading for several years. 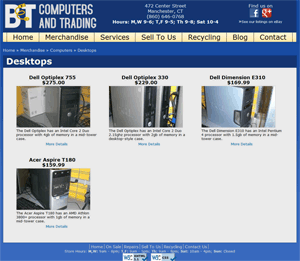 Of course, the old website displayed none of this, and the business name wasn’t helping. So several months ago we began to change things. First, we’re now B&T Computers and Trading, reflecting the fact that we do more than just computers. Second, we can now show a lot more merchandise than we did before. Finally, the website address has changed: it’s now bandttrading.com. No need to update your bookmarks, though–the old address will redirect you here. Though if you’re reading this, you probably already know that. Do you still do computer repairs and upgrades, and build new custom computers? Sure do! Though we’ve expanded our offerings, the things that have gotten us to this point–namely our computer repair, upgrade, and custom build services–have not gone away. So be sure to bring your misbehaving computers in for a diagnosis. We fix both software and hardware issues on desktops and laptops. If you’re looking to upgrade your machine, or get an entirely new one built to your needs, we do that, too. Simply, it means an exiting new era for B&T. We started out in 1994 in the basement of our first house, and you had to have an appointment to visit. The new website presents the next logical step in our evolution. There is more to come, so stay tuned for developments. Also, please be sure to join us on Facebook and Google+ for more frequent updates and information about special offers and discounts. Finally, though the website is ready to go, it is slightly rough around the edges. We’ve tested all areas of the site, but it’s possible you could run into bugs. Bear with us as we work out any final kinks. And we are still in the process of adding merchandise, so what you see is definitely not everything that we have for sale.